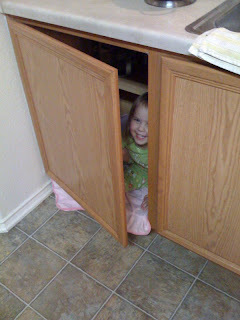 Abby found out we have an empty cabinet so she decided to claim it as her own and play in it which is fine by me. While Gigi was here she said when she got in the cabinet that she was going to Paris with Pops so now the cabinet is Paris. Abby visits quite frequently - jet lag will have to catch up soon I'm sure! Too bad she isn't getting real frequent flyer miles to use!